The rudder was built according the the plan shown above which is based on what was used on the SC&H 1:24 scale kits. It's simple, strong, easy to maintain, and looks good. 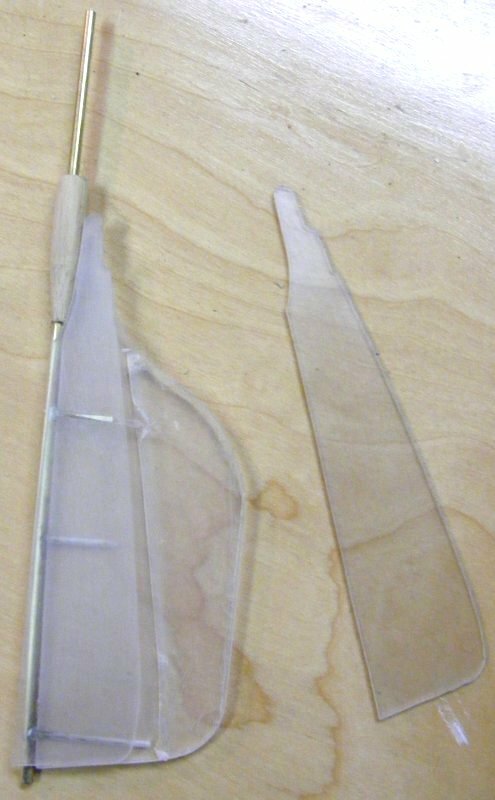 It's mainly of a 5/16" thick piece of Plexiglas, with some thin panels, shaped to the scale rudder, applied to the sides. The idea here was that the non-scale potion would be clear, and not so apparent to the casual viewer. 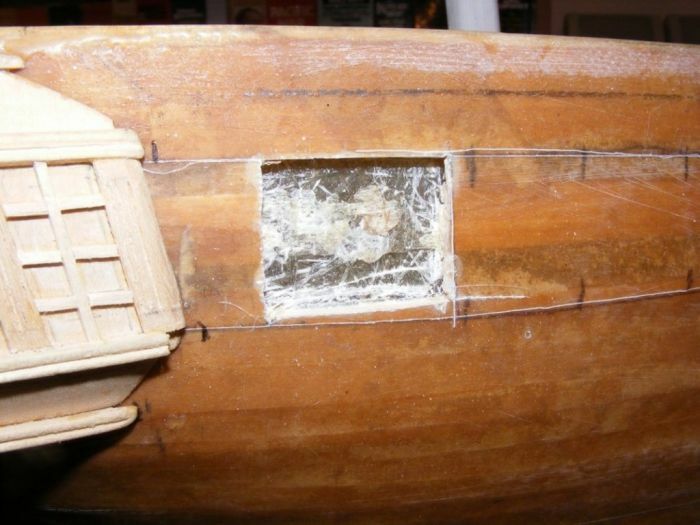 A brass rod ran up the leading edge, and was attached with epoxy and drifted with smaller brass rods that are actually soldered the the larger rod - and all of it glued. 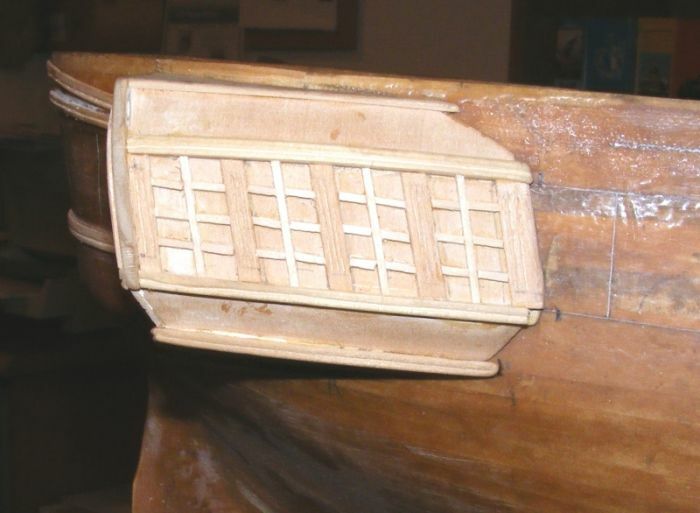 The real rudder flows into a round portion that fits into the hole in the hull. Here I used a bit of 1/2" maple dowel with the brass rod going right through it. 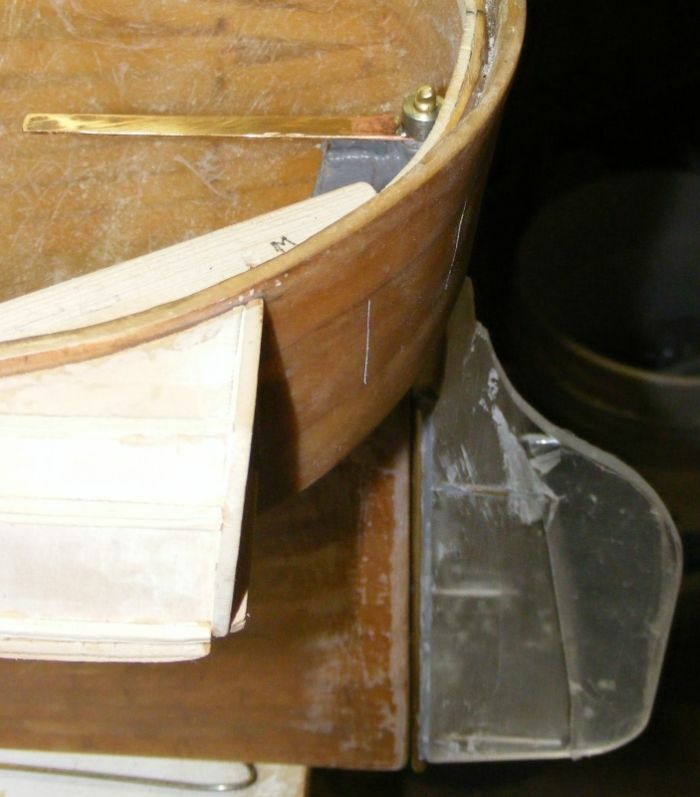 On the hull, a 1/2" id brass tube was already installed, that the dowel fit into. 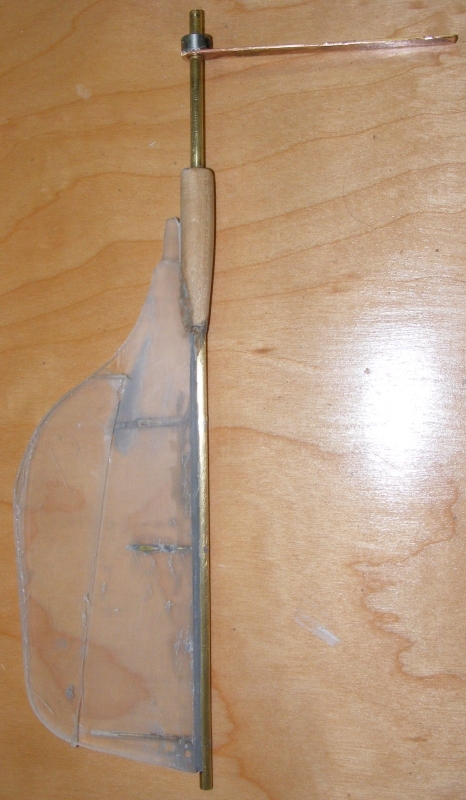 Covering the dowel with plastic wrap, and inserting the rudder where it's supposed to wind up, I slid a brass tube that fit over the the rudder's post and filled the space in the hull tube with J B Weld epoxy. 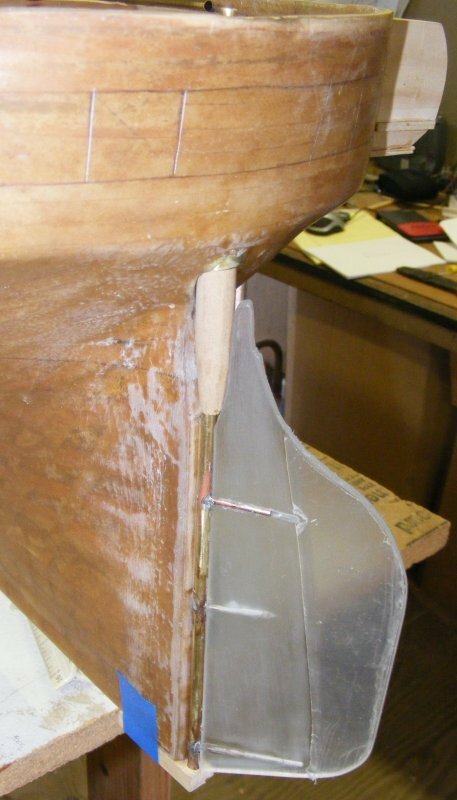 When set, the J B Weld formed a bearing block in the 1/2" tube that prevented the rudder from riding up. It has a 3/16" id tube in the center that's a bearing for the rudders 3/16" post. Inside, on this post, the tiller is attached. It is a piece of 3/32" thick copper flashing soldered to a steel shaft collar, and held on the rudder post with a set-screw. This on it's own prevents the rudder falling out. 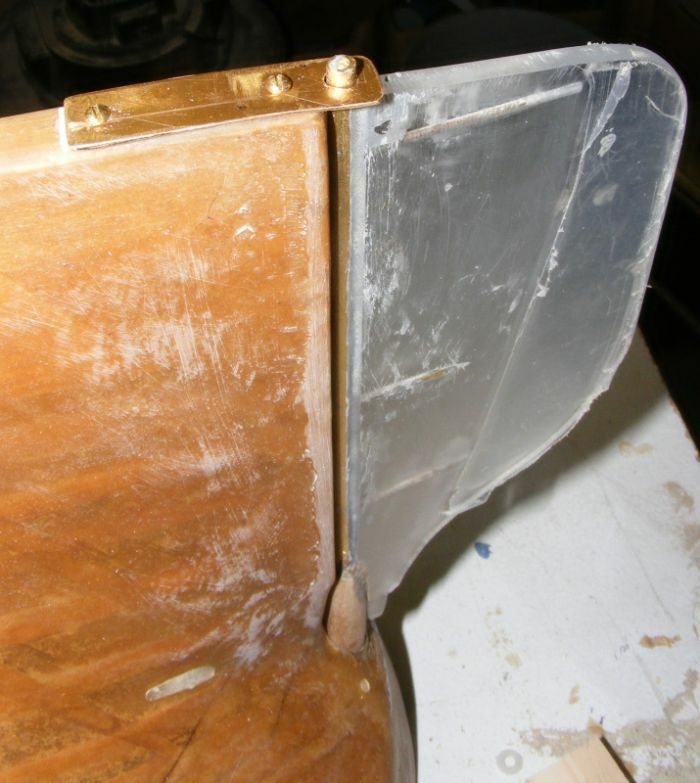 At the bottom of the rudder is a gudgeon plate to support the bottom end of the rudder post. 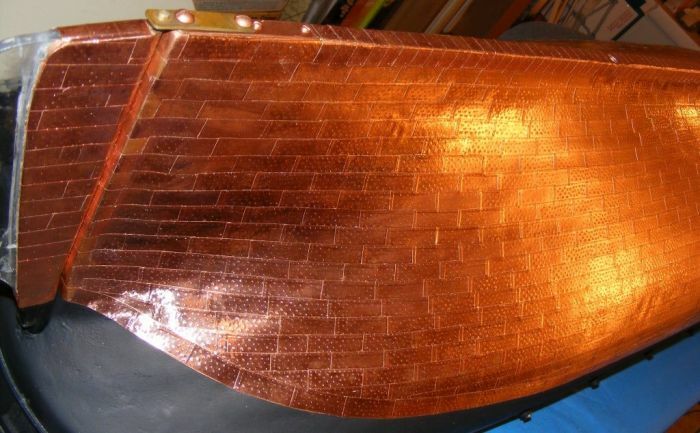 Two pieces of the aforementioned copper were cut; one was inset into the keel, the other would be the removable plate. 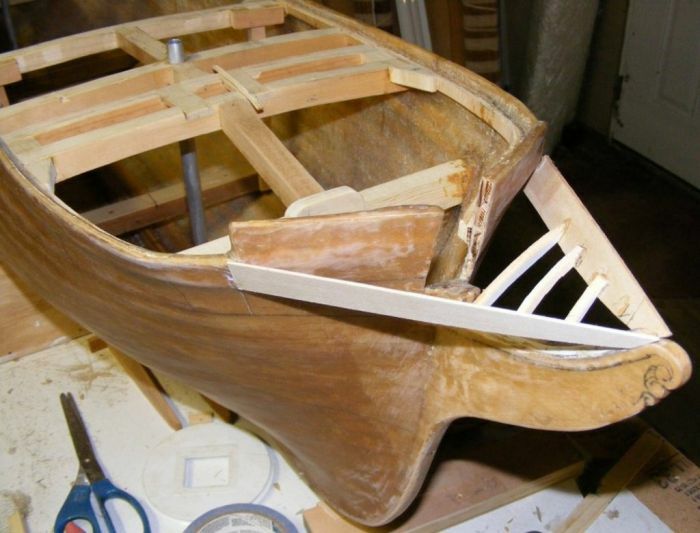 The keel piece was inset, epoxied, and screwed. 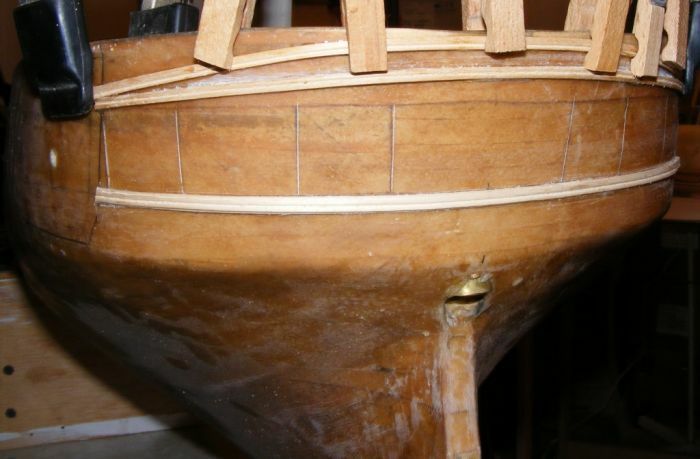 All the hole made in the keel were drilled oversize, filled with epoxy, and drilled for the fasteners - that way the is no way for water to get to the wood in the hull. 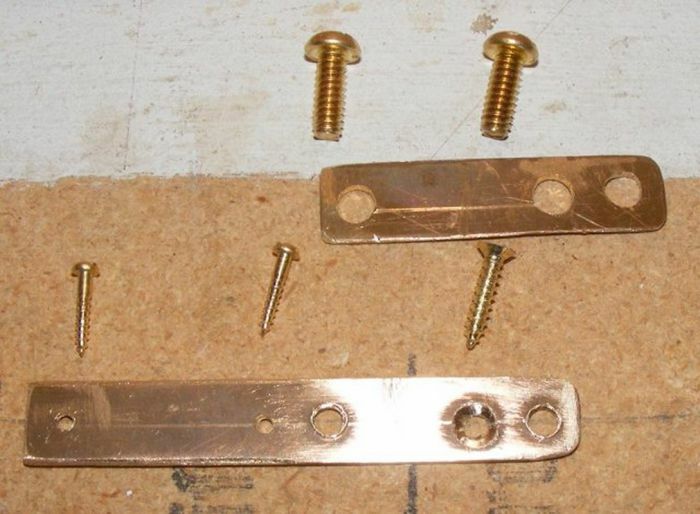 Two of the holes were tapped for the two brass machine screws that would hold on the removable plate. 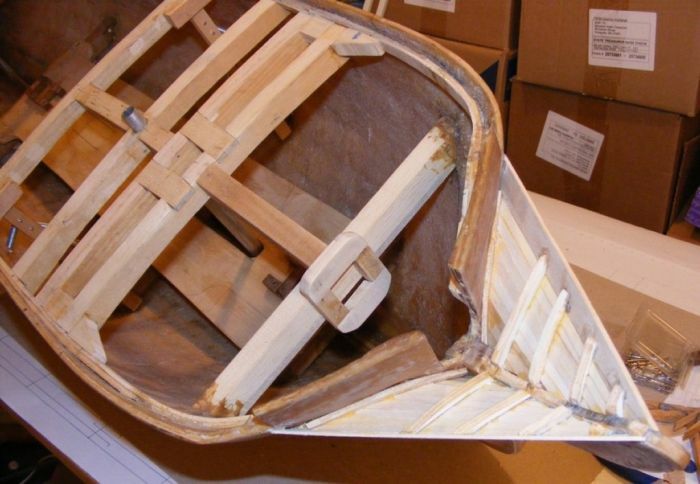 If the rudder needs to be removed, two screws that hold the plate are removed, the set-screw in the tiller collar is loosened, and the rudder slides straight down and out. 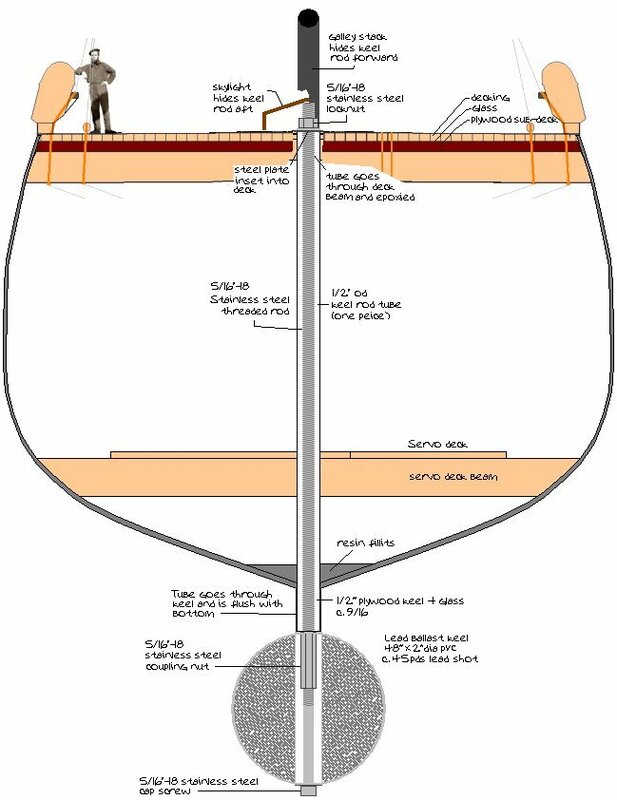 From the start, the intention was that most of the ballast would be in the form of a removable lead bar bolted to the bottom of the hull. I had built several smaller models using this idea and basically, just scaled it up. 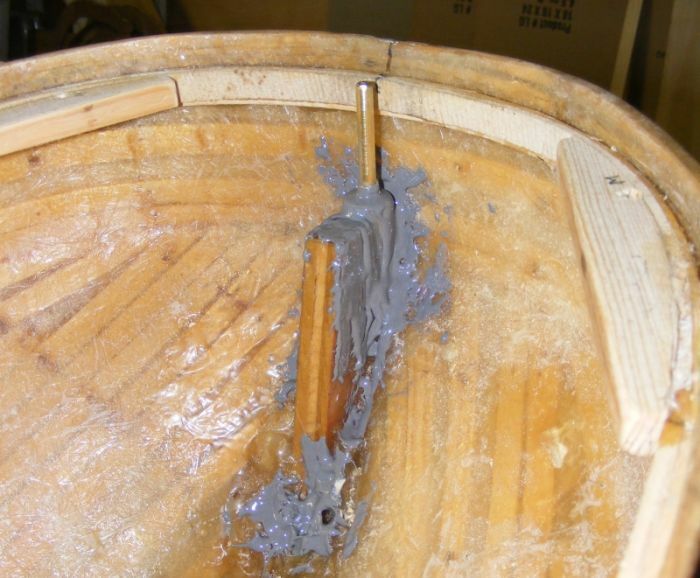 I had intended to pour a lead bar about 4 feet long, 3/4" thick, and about 4" tall that would weight about 50 pounds, but I had never poured that much lead before, and even when I had it on hand, I was nervous about doing it. I eventually opted to fill a 2" id PVC pipe with my bird shot. I drilled through the pipe and glued in a pair of smaller tubes that the 5/16" stainless steel threaded rods would pass through. These stood a little proud of the surface to match the thickness of the end caps. I glued a cap on one end, poured in he shot, drilled a 3/4" hole in another cap and glued it on. I filled that space with lead through the hole, and bumped the thing on the ground to settle the shot, filling it in between thumpings until I couldn't get it to take anymore. Then I cut a PVC plug and glued it into the hole in the cap. It wound up weighing 42 pounds and to this day it doesn't rattle one bit. The rods are actually cut flush with the nylon nuts at the top, and slotted so I can use a screw-driver to put them on and off. The stovepipe was intended to be held on by a magnet, but the rod being stainless killed that idea, so I'll have to attach it's disguise another way. Now that I had made all the holes in the hull I intended to, I was itching to get it wet. On October 4th, 2009, when we took my 16 footer Lydia out sailing, I tossed the model in the back of the truck for it's first ever float. 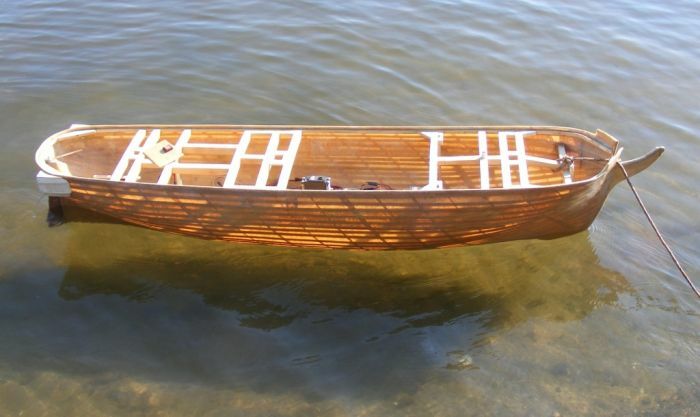 After our sail and retrieving the boat, I went to put the model in and realized I had forgotten the threaded rods. In she went anyway. I pushed her down to her water line and happily didn't see any leaks. 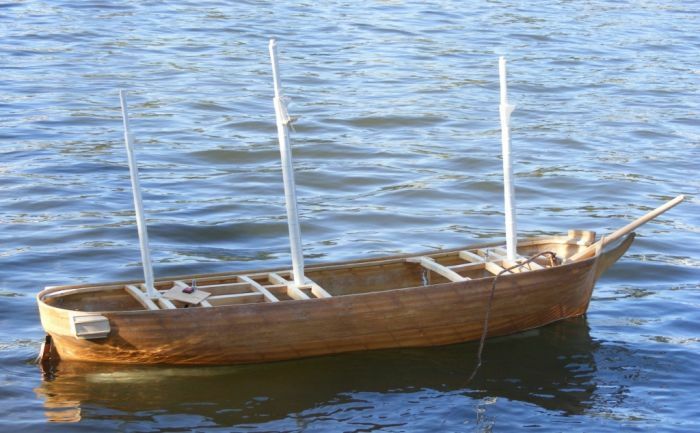 I still wanted to see how she floated with ballast attached, so a few days later, on the 7th, I took her down to the creek again, ballast and rods verified, and even the lower masts, and in she went again. Her radio gear, battery, the tools I attached the ballast with, and the balance of the 50 pounds of bird shot in plastic bags all went in; and she still floated 2" high. I guessed with the rest of her rig, decking, and whatever details, she'd still need another 15 to 20 pounds of internal ballast to get her down to her lines and trimmed, and would weight in between 105 and 110 pounds. I wondered how you'd decided how much ballast you needed - now I know! 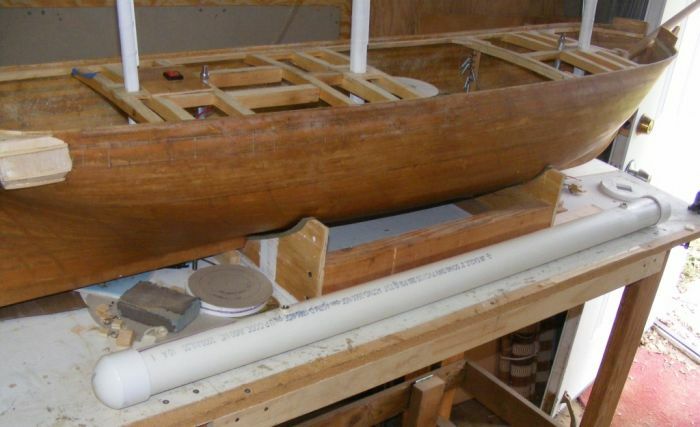 I suppose it wouldn't have been too much of a problem to remake your external ballast in a larger diameter tube but 15 to 20 pounds in a hull that size sounds as though it wasn't a problem - and it lets you adjust the trim. PVC comes it certain sizes. The next size up from 2" id is, I think, 4" id. At any rate, it's so much larger as to be a hindrance to the model and a pain to deal with. I may go with iron pipe, or steel tube for Macedonian as her's needs to be a little shorter. This forum is quite picky and awkward about attaching images, so I have to pick out those for the next installment and resize them so the forum will accept them. Working from that, I enclosed the head on the model... The framing is pine from the louvers of an old shutter. The planking is 1/16" sheet bass. 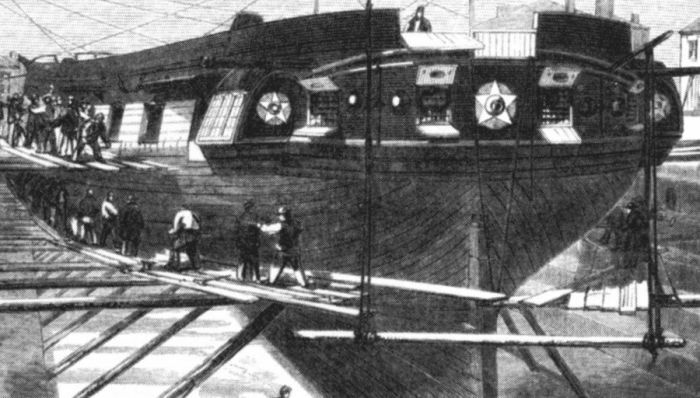 How the stern looked on the ship when she was painted by de Simone in 1856 was a bit of a mystery. The only information I had was a litho of her in the drydock in Boston in 1859, when she returned from that deployment. Molding wise, this was very different than she ever looked later, in any images where her stern can be seen, but it was pretty typical of the stern decorations of her contemporaries. There's a lot of detail in this image, at the same time there isn't. 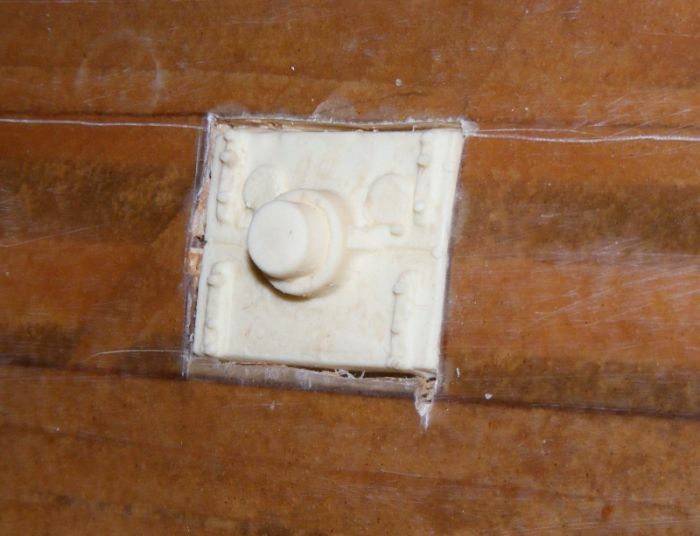 We'll come back to some other items seen here, but for now - this was my guide for the moldings of the ship's stern. 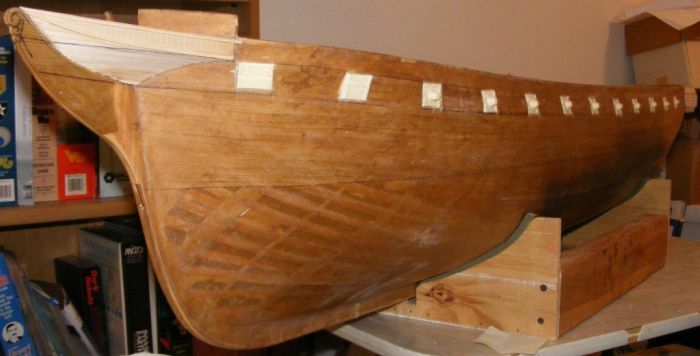 I started by taping tracing paper on around the stern, and marking the positions of the stern ports, backs of the quarter galleries, the knuckle at the bottom of the transom, and all the pertinent layout. This I laid flat on the scanner, and used the scan in a drawing program to draw the stern. Printing this out gave me a full size template to work from. 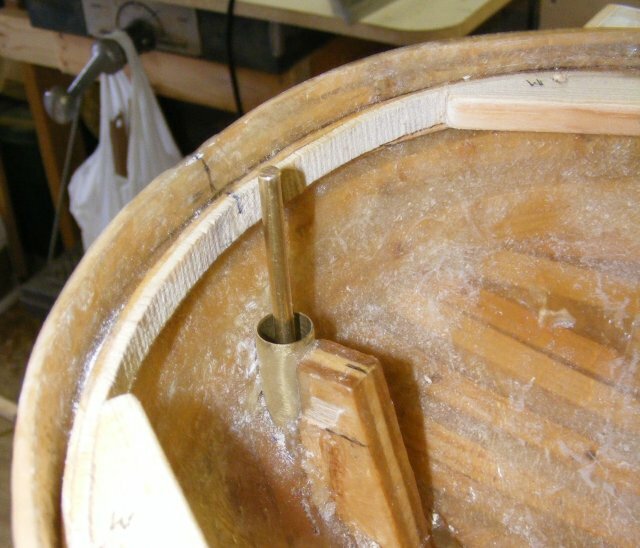 The mouldings are pine strips shaped with a shaped scraper made from a used utility knife blade. You'll notice in one shot the quarter galleries are missing. They were held on with a wood screw so I could remove them when necessary. They do got some more detailing, but not permanently attached to the hull just yet. I had an idea of how I was going to do the gunports, but wasn't sure how it would work out. 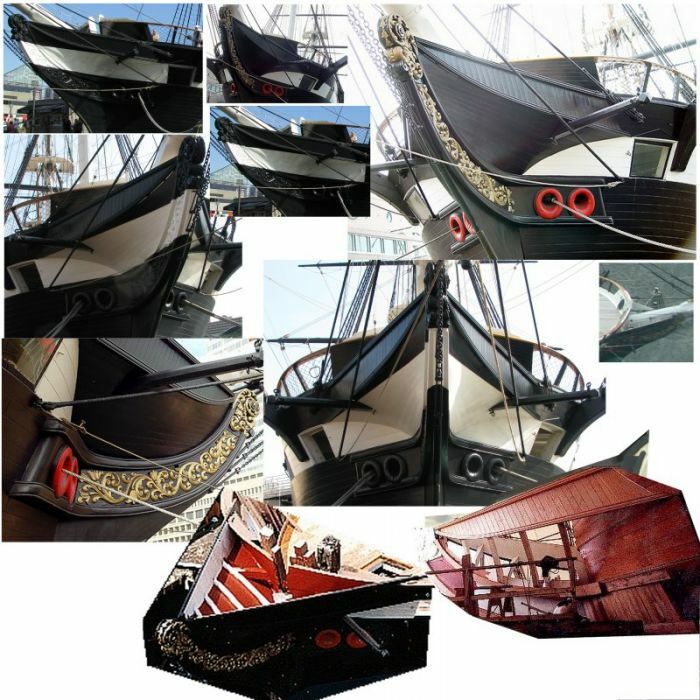 By Constellation's time ships were fitted with the sort of gunports you can find on the Constitution today. Split ports with two lights in the upper lid and a hole for the gun's muzzle to poke out a bit when the gun is stowed and the port's closed. 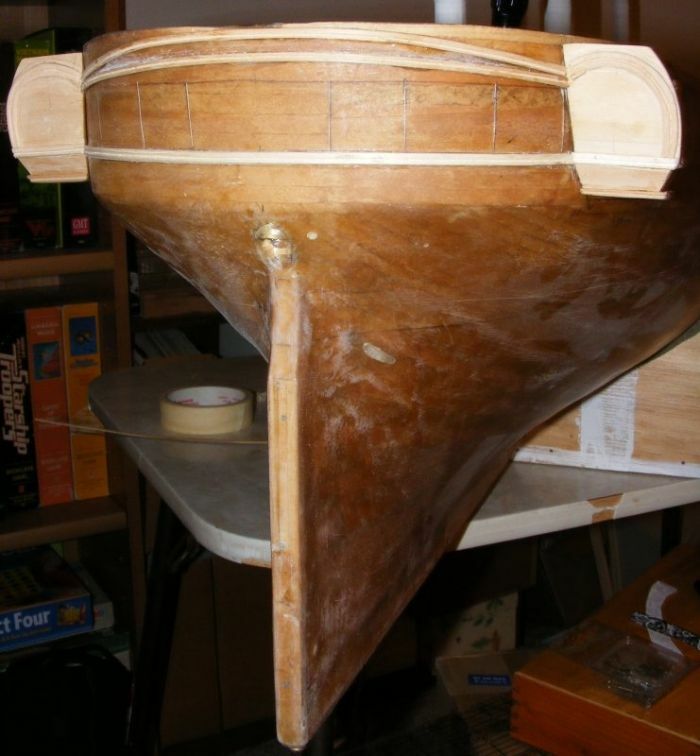 I planned to cast the entire assembly, ports, muzzle with a tampion in it, and in one resin piece, and mount them in the hull. I wasn't modeling the gun deck, because this was a working, sailing model and I felt it best for keeping the hull water-tight. I was scratching my head on how to mount the resin gunports in the hull. I began carefully cutting out one gunport. Because of the hull's odd construction, I cut out the surface layer of glass cloth and brown paper tape, then the 1/8" thick wood battens and resin fill between them. That got me to the glass mat layer inside, which I left alone. This was perfect as I didn't have to cut completely through the hull and could make nice recesses to glue my resin ports into. So I rolled some clay out between two sticks to get the right thickness; then made up a stamp to press into clay. I used a wood rectangle with the seam between the ports engraved in it, some paper tape to denote the hinges, and couple of bits of dowel to form the muzzle and tampion. 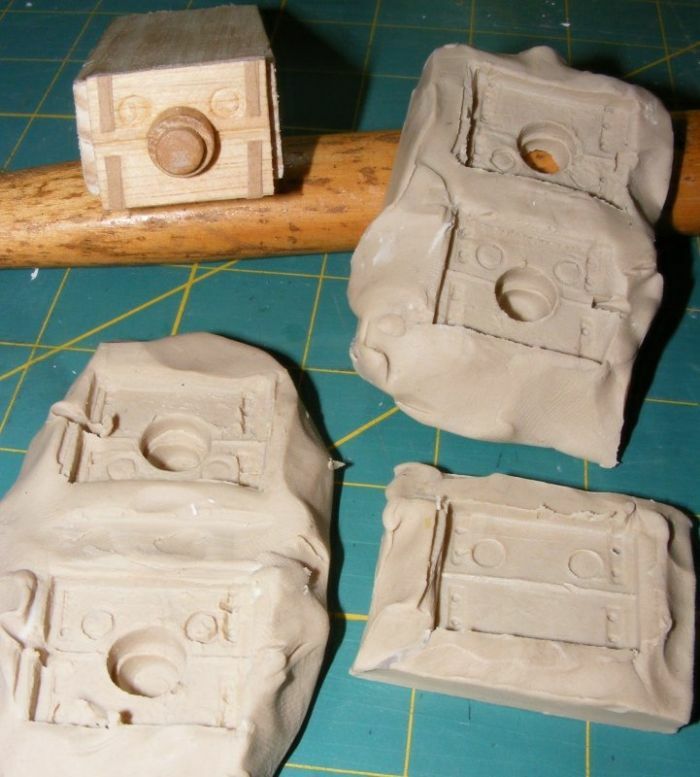 After I stamped the clay, I used the end of some tubing to make the port-light rims, and an allen wrench to form the hex-heads of the hinge bolts. A couple of alterations until I got what I wanted, and then I stamped out 20 of them and poured the resin. The yellowish tint of the resin had me thinking this would be a neat sort of way for a restaurant to pour pads of butter with some distinctive pattern or logo on them. No, not in clay. 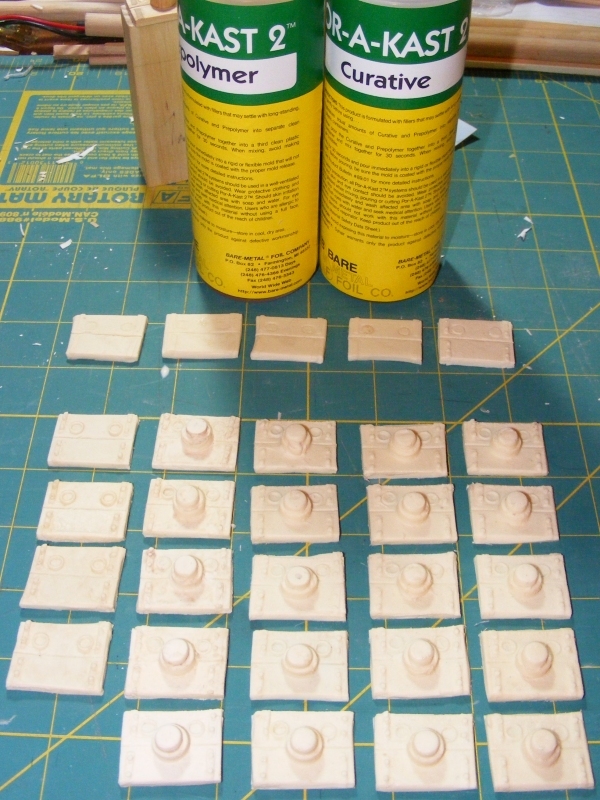 Eventually all the ports were cut out, and the resin gunports epoxied in place and any gaps around them filled. Sail making for models is a pet-peeve of mine. I've seen models so perfect in every detail that look like they called in some twonk that doesn't know which end of the needle the thread goes through to do the sails. 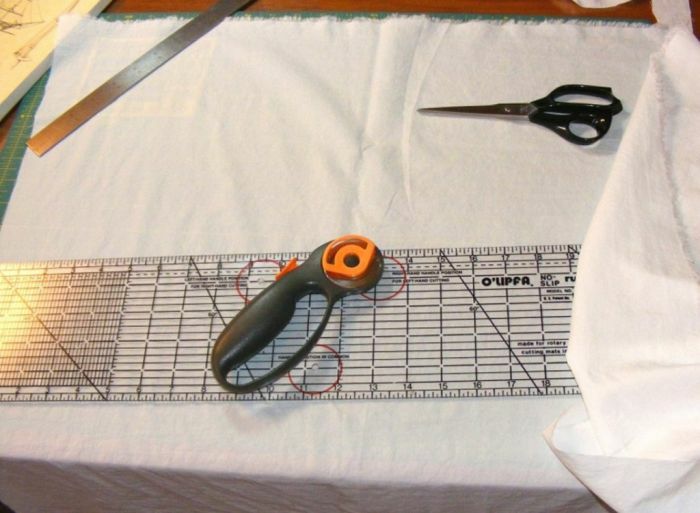 I've actually read many modelers actually use the excuse that sewing is "woman's work!" 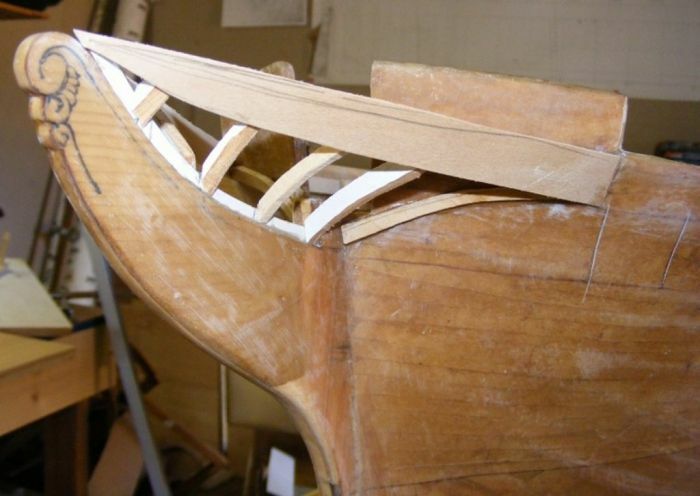 Many forums have topics dedicated to sails that are filled with all the reasons to NOT have sails on a model sailing ship except the real reason - men are afraid of sewing. They needn't be, as scale sails can look great without very much sewing at all. Well, a working sailing model MUST have sails up to the task. 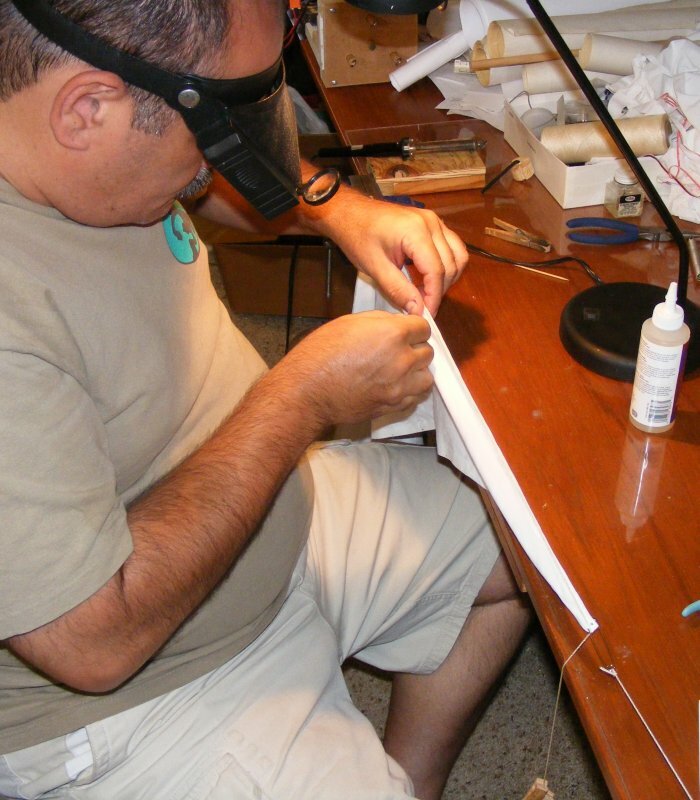 Besides, I was raised by two professional seamstresses; and worked for a sail-maker for a while. 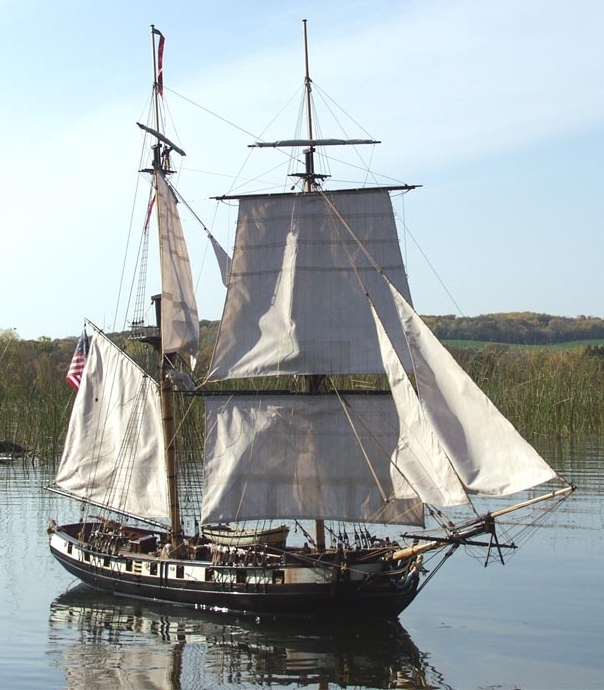 I've sewn patches and bolt-ropes on real canvas sails on the vessels I've worked on; I can't make any excuses. From folks on the RCGroups forums that have the SC&H large scale model kits, I learned about DuPont Supplex Nylon cloth. 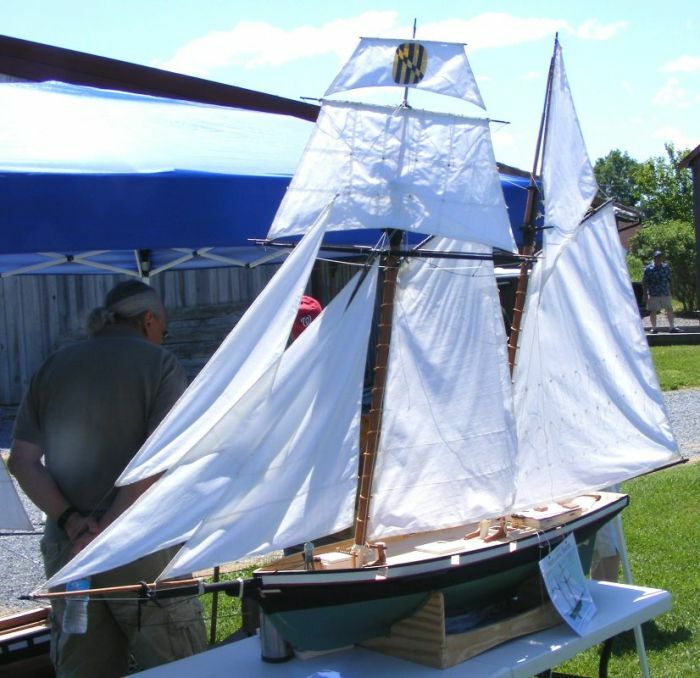 Here's the 1:24 scale Grasshopper kit modified as the US brig Syren with the kit sails further detailed by Dan Lewandowski. BTW; those t'gallants are full sails furled to the yards. This stuff is great, perfect for sails on a model this size and even smaller. It's strong, wrinkle resistant, water resistant, light, looks like a scale canvas weave, and is thin, almost sheer in sunlight. It comes in colors including white, but the real drawback is finding it. There's a few places that sell it, but the color selection is often limited. There's links to two sources on the links page of my site (linked in my signature). Being a Nylon, ie a synthetic, it offers something natural fibers can't - it melts. 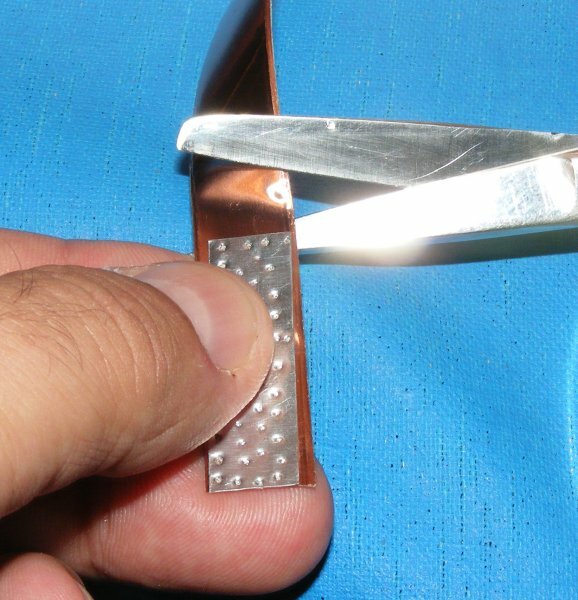 It therefore can be cut with a hot knife (a soldering iron with a hobby-knife blade for a point) which melts, ie seals the edge as you cut the cloth. 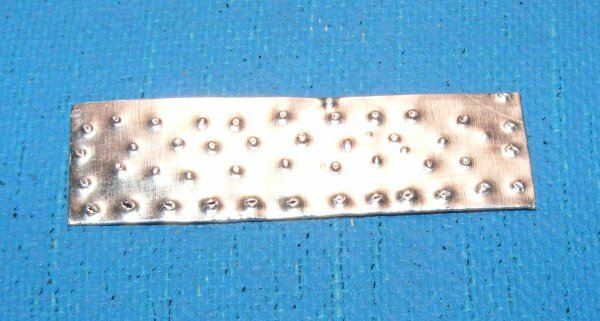 With a pointed tip in the iron, you can make whatever holes are needed, such as for reef-points, that are sealed and look like grommets. 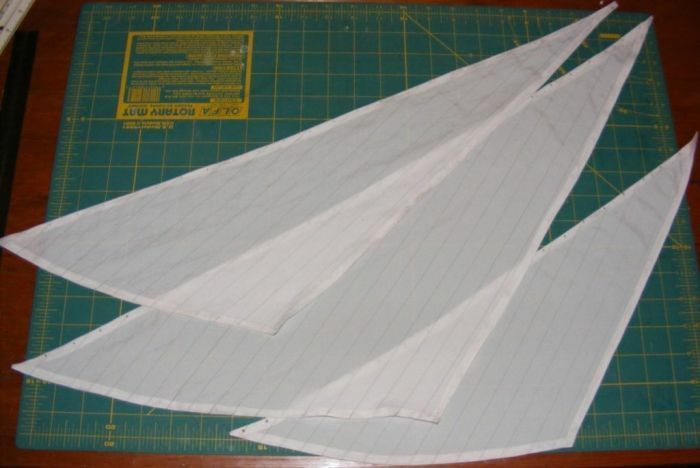 If you have any thought of building a working sailing model, this is the cloth for your sails. Constellation's suit of 17 sails came out of 2 yards of 55" wide cloth, with some left over for patches, tabling, reef-bands, etc. I didn't have a blade for my soldering iron, so I cut my cloth with a rotary cutter and carefully ran the iron along the edge to seal it. Get a hot-knife, no matter how careful you are, it's very easy to really mess up and ruin something this way, especially on long thin strips like reef-bands. The sails are drawn on the cloth so the grain of the cloth follows the panels of the real sail. 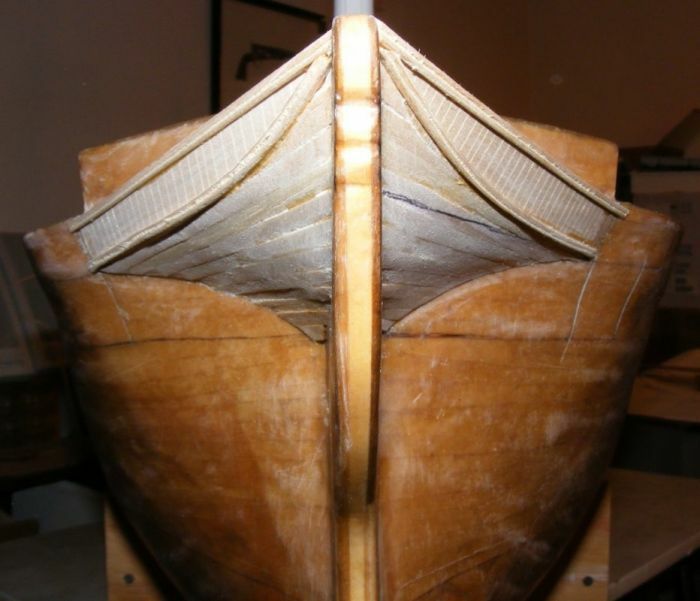 Square sails therefore go across the grain; heads'ls keep the leech along the grain as do gaff headed sails typically. 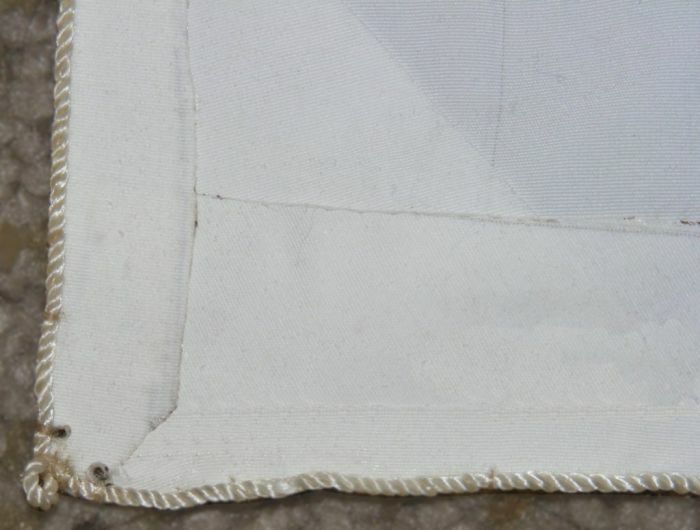 The seams of the panels of the real sails are represented by drawing lines on the cloth with a very fine point permanent marker. These are drawn on both sides, but very slightly offset to represent the typical 1" wide seam. I ruled the seam lines on a sheet of white poster board and traced them with a straight edge on the cloth to keep everything uniform. 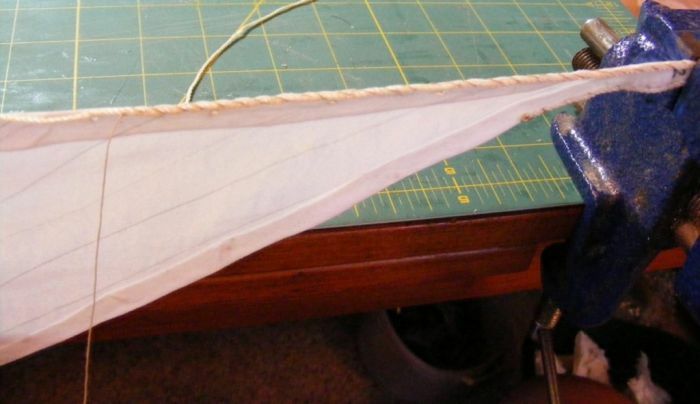 Many modelers insist on stitching seams which in my opinion is pure nonsense and why model sails usually look like, well, crap. Even the finest stitching you can manage on a large 1:24 scale model will be 3-6 scale inches long! 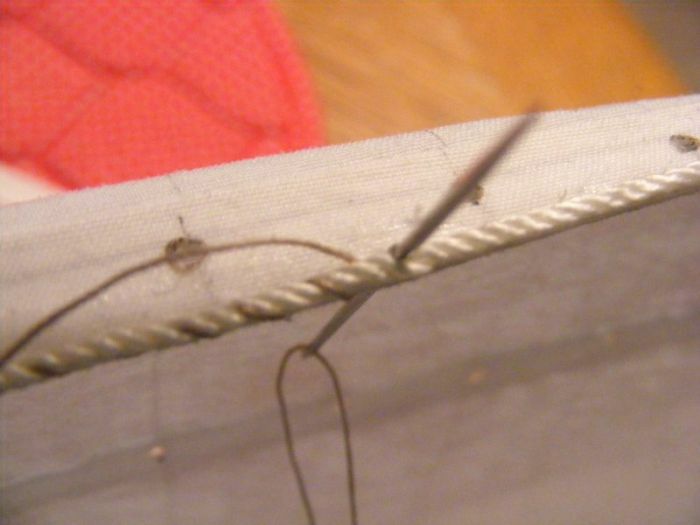 Typical hand stitching on a real sail is about 1/2" long - at most, and at 1:24 scale that would be less than 1/32" long. The thread itself is about ONE INCH in diameter at 1:24 scale, and most modelers work in far smaller scales, yet run cables in 3 foot loops through their model's sails. Draw your seams boys, and save yourself a lot of useless sewing you hate doing anyway. 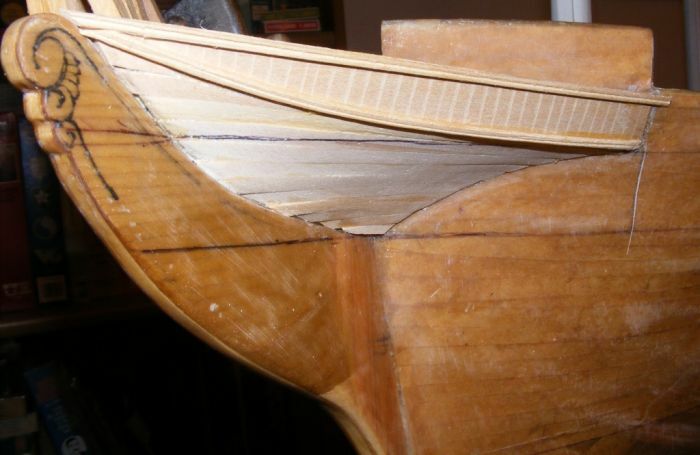 When the sails are cut from the cloth, now is when corner patches, tabling, reef-bands, and all those cloth patches on the sail are cut and glued on where they belong. I use fabric glue such as this stuff to do this. Then comes hemming. 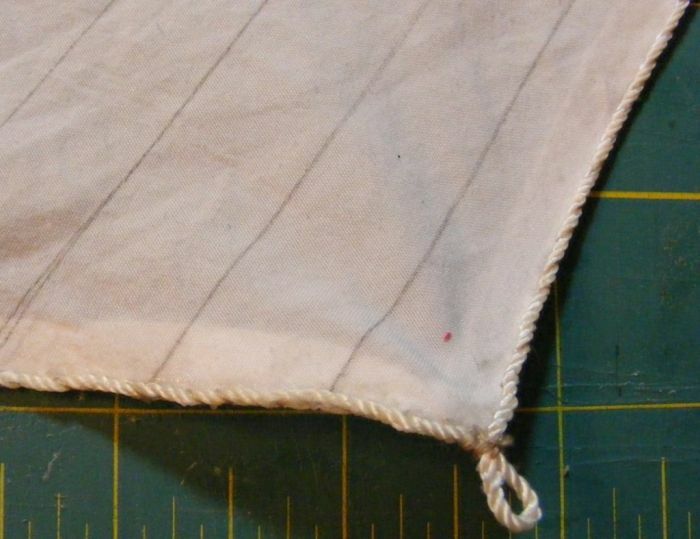 I drew the sail with a 1/2" border all the way around, and folded this over half way then again for the other half to get a 1/4" finished hem - which is about right at 1:36 scale. That buries the raw edge inside. 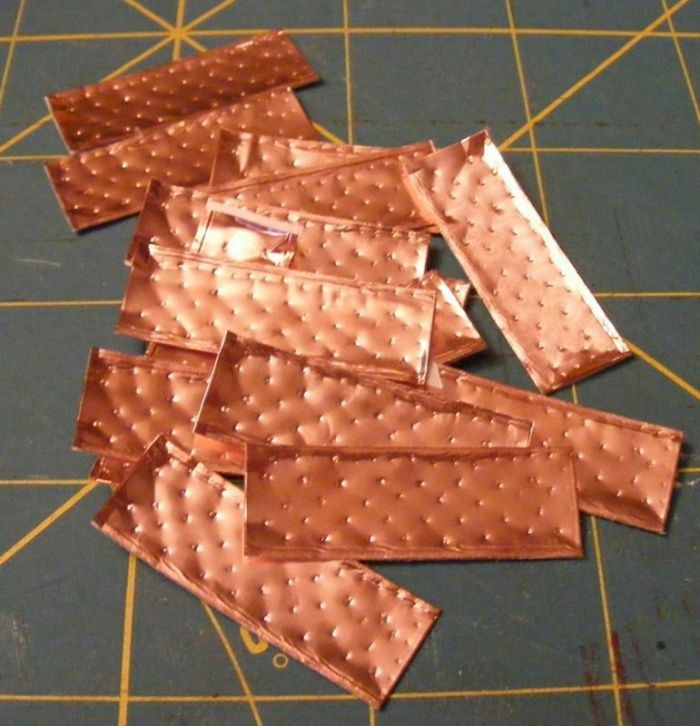 Each fold is ironed and glued with fabric glue. After hemming, I usually make all the grommets the sail needs now. 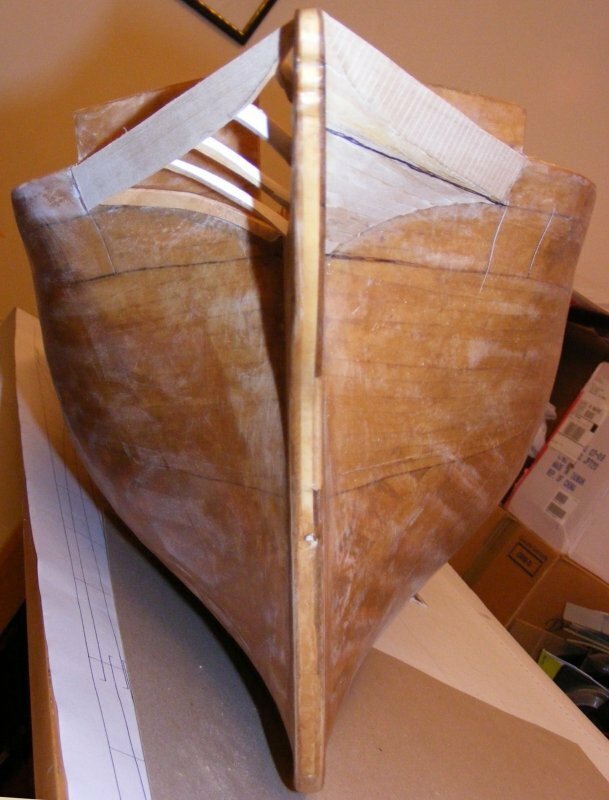 Here's the heads'ls all hemmed, and note the grommets for the jib hanks along the luff of each sail. Then comes the bolt-rope. This is where the sewing comes in, so brace yourselves. 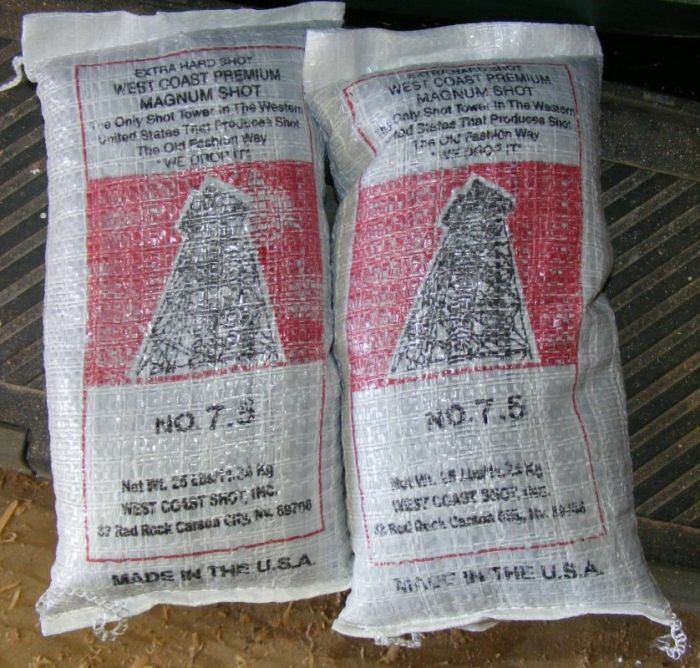 I used a nylon/polyester mason's string for my bolt-ropes. This is wound a little tighter, or "harder," than the nylon cord sold in the big hardware places, and doesn't have as much stretch to it as that stuff. I work one edge of the sail at a time. Anchor one end somewhere, like a clamp-on vice shown here, and safty-pin some cord to the other end and attach a weight to hang and pull out the edge you're working on. You're not trying to stretch the sail, just hold it out taught to work on it. Do the same with the line for your bolt-rope. You need enough line to at-least go completely around the sail. I don't even cut it off the spool until I have it sewn on completely. The bolt rope doesn't start at a corner of the sail, but somewhere along the edge. On squares I start near the middle of the head. On other sails I start near the top of the leech. As it's sewn on, the other end will over-lap the starting end a little, so strength isn't the issue, but you don't want to deal with this bit of added bulk at a corner. Bolt ropes are not attached on the sail's edge, but ON the sail along the edge. 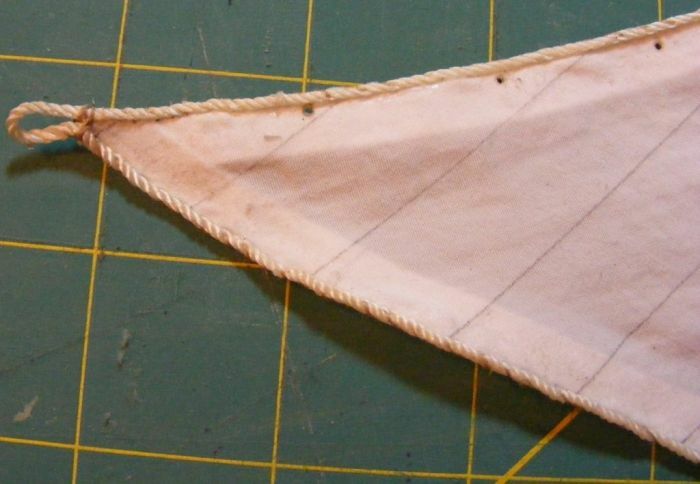 The bolt-rope on squares is sewn onto the forward face of the sail; on fore-and-aft sails I like to alternate sides. 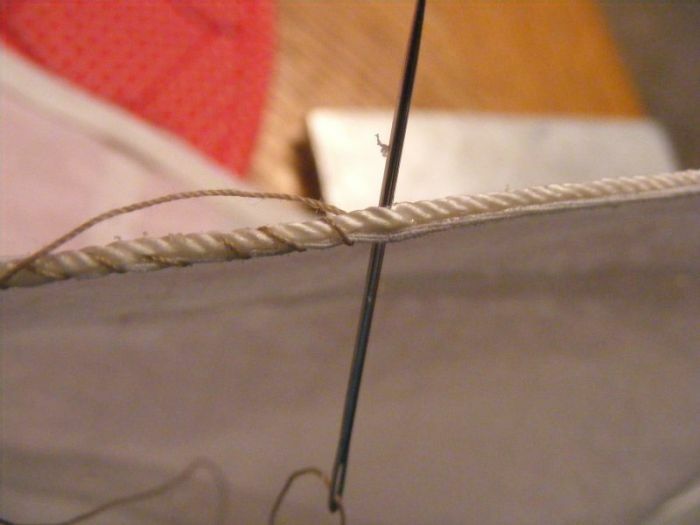 On real sails the sail-thread is doubled and sewn between two strands of the bolt-rope, and through the third, into the sail, and repeated along the edge at every strand of the rope. This is where I cheat. 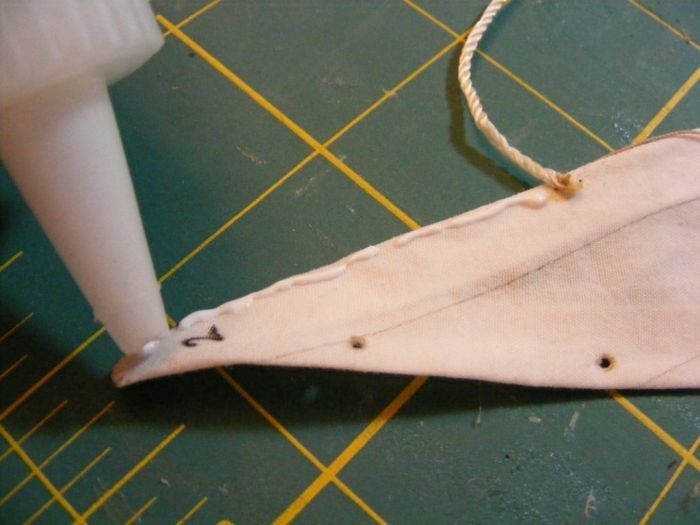 First I run a bead of fabric glue along the sail's edge for a couple of inches, or the length I can sew before the glue sets (this reinforces the stitching, and is why less stitching is required). Then I sew using a single thread. I find it easier to push through the sail cloth, into and through the bolt-rope, coming out between two strands-ish, come back around to your side of the sail again, skipping maybe three rope strands along, and back through the sail, and so on. 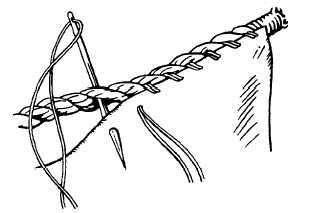 You want the thread's angle the same at the lay of the bolt-rope so it will tend to hide itself in the rope's strands. 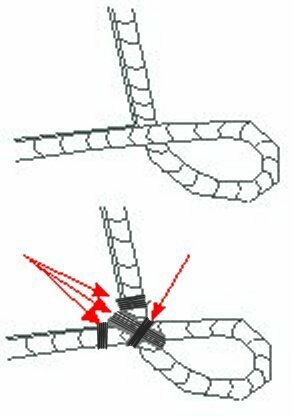 All along you want the sail and bolt-rope about the same tension - don't try to stretch one or the other or the sail will have kinks and curls when it's set. As I went along, at points maybe every 6 scale feet along the edge, I took a few tight turns with the thread in place, basically a seizing. (normally I made a "grommet" in the sail at these points just for this) On real bolt-ropes this is done to keep the bolt-rope from pulling. 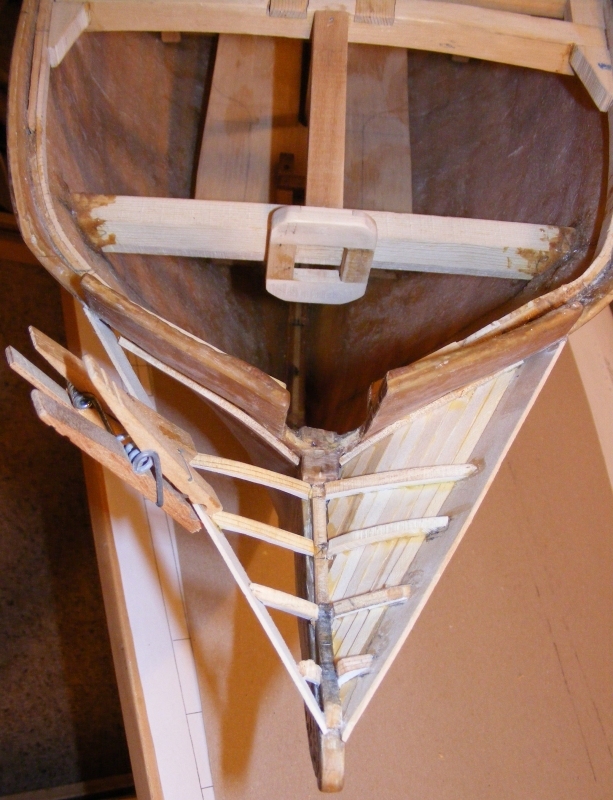 Since it's basically whip-stitched on, it can get pulled and tugged and even break stitches as the sail functions. It serves pretty much the same purpose on the model, especially as you get near corners and on either side of eyes. At the corners, I cheated again. I didn't make them the way proto-type sails were done in Constellation's time, with iron hardware, etc. I made eyes for reef cringles, bow-lines, head cringles, clews, tacks, etc by simply looping the bolt rope, I took a turn around a round tooth-pick, but use what ever is best for your model's scale; brass rod, dowel, etc. 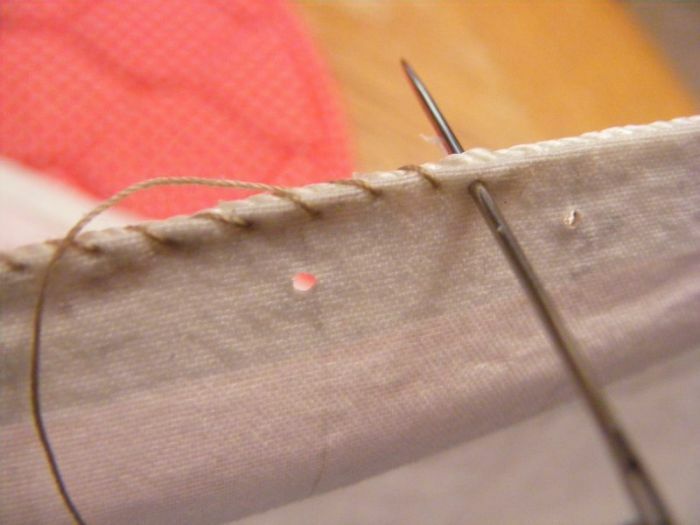 The tooth-pick serves to hold the loop open at the right size until you sew beyond it, and is then removed. As mentioned above, I pop in seizing about 3 scale feet from the corner, and another right at the corner on either side of the eye, and very importantly, a seizing IN the eye to prevent it from pulling open or closed. That is pretty much it. 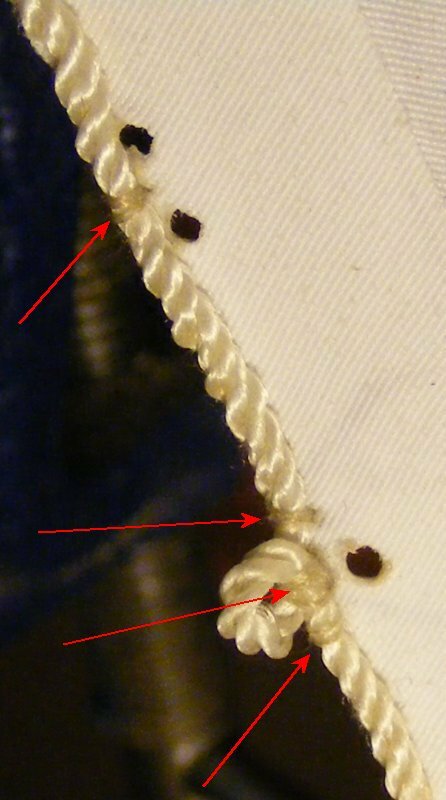 Basically the only sewing done is the bolt rope, and that is done by hand as were the real ones, and very nearly in the same manner. 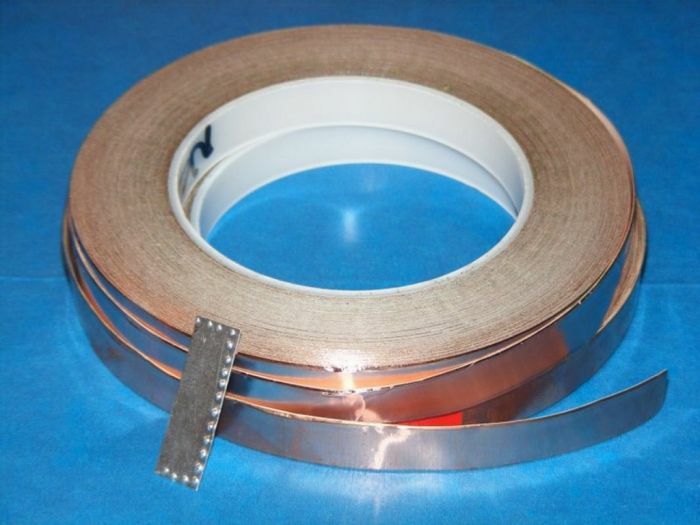 I order three rolls of 1/2" peel-n-stick uncoated copper tape from an electrical supply place on-line, because it was hard to find 1/2 wide stuff at modeling suppliers, and they charge nearly twice the price for it! This stuff was also intended for outdoor use - which I intended to fully test. Speaking of testing, I did stick a few pieces on a plastic coffee can and left it outside for a few weeks. I gave the hull a quick sanding with 220 paper, then washed it with dish-washing liquid. 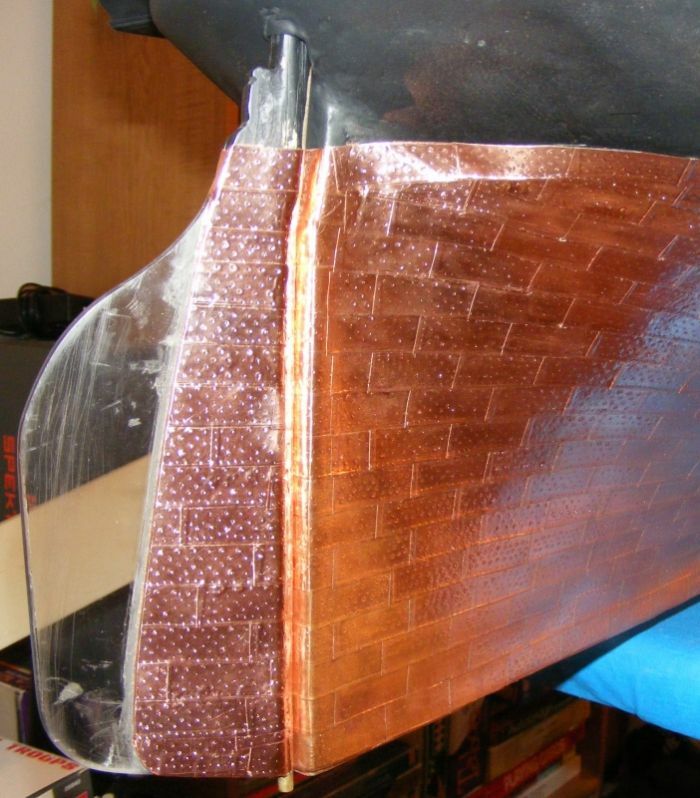 I used Kyron spray paints and gave the hull a very quick and dirty paint job, though the bottom got two coats of the metallic copper paint as an under-coat for the copper tape. That little bit of paint was a big transformation. The model was beginning to look like what she was supposed to be. Now it was time to copper the bottom. Coppering on models is another pet peeve. 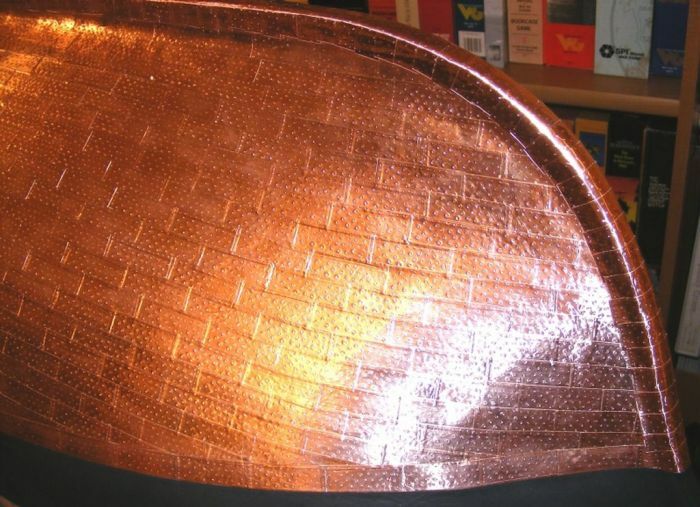 So many models have thick copper covered in round headed rivets, like it was armor plating or something. Copper was very thin, and it was nailed on with counter-sunk flat headed nails with conical heads. 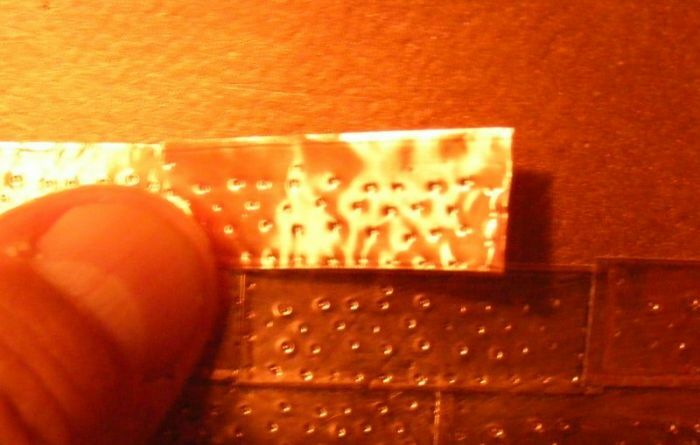 Instead of round nail heads, you should see what amounts to spots. So that's what I went for. 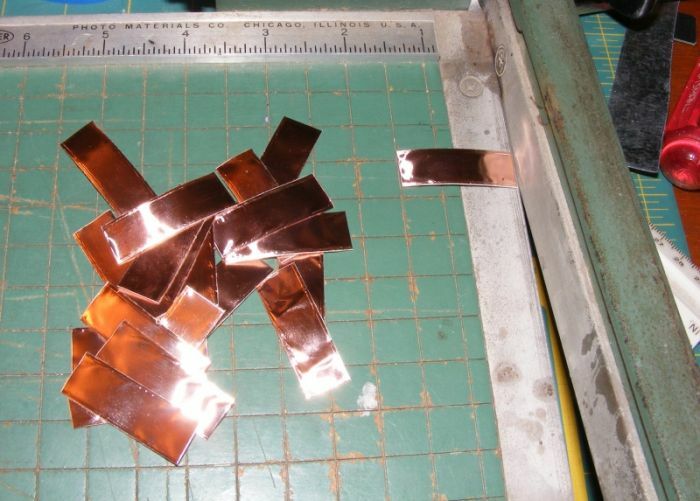 I made a 2 plates from some sheet aluminum that was the size of my 1:36 scale copper plates. Then I indented it with a nail point I grounded round according to the nail pattern used, including the nails along two edges. The plates over lap each other like scales, with plate forward and higher overlaping plates aft and below. That's why I needed two stamp patterns, one for port and one for starboard. I initially used the pattern to measure the plates as I cut them off the roll, but switched to using a small paper cutter. 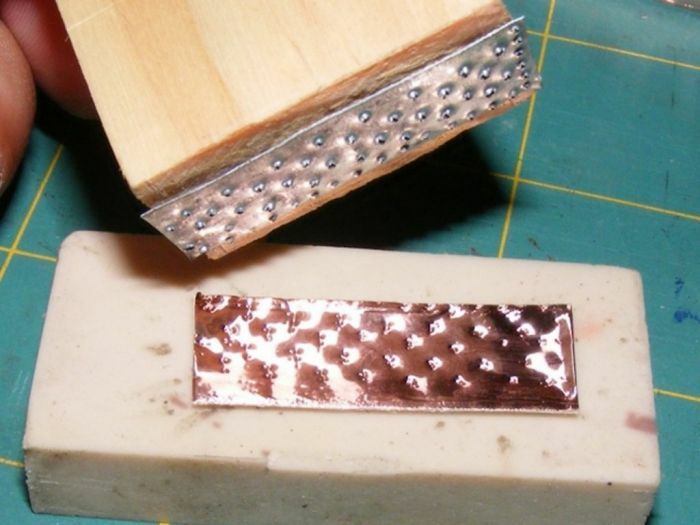 I tacked the pattern to a block of wood with some hot glue, and began stamping the front face of plates on a Mars eraser. This went pretty quick. 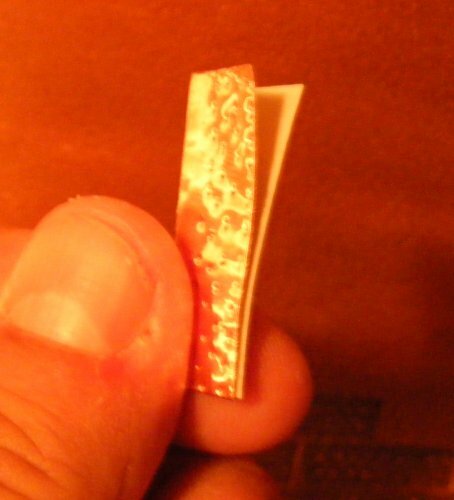 Pressing them like this also made the backing paper easier to peel. Each plate went on with the edge nail marks up and aft. Rubbing them out pushed the indentations back out leaving a bit of a donut mark where the nails would be, which was exactly what I was after. 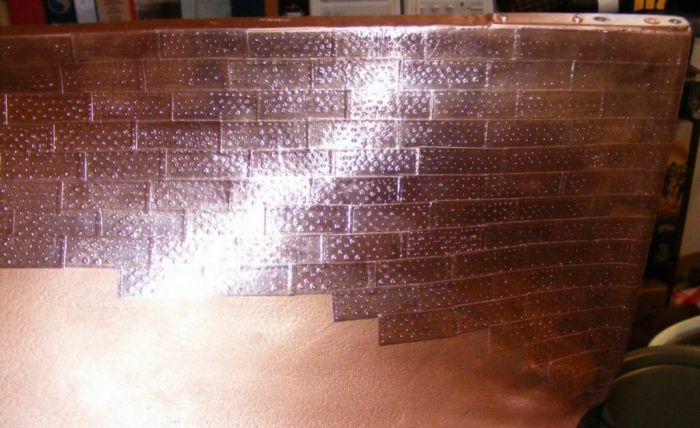 It was a tedious job, and rubbing the copper plates on cut up my finger tips like crazy, but it was worth it in the end. Now, instead of a log, I had a copper bottomed pot.